Foursquare Passes 1 Million Check-Ins A Week. Rate Doubled In The Past Month. Yesterday, we got a nice little breakdown of which clients are used most often for the location-based service Foursquare (hint: still the iPhone). Today, the company has some new big news to share via a tweet: they’re now doing over a million check-ins a week. Not even a month ago, Foursquare noted that they were seeing a check-in each second. We extrapolated this out to show that they were getting roughly 86,000 check-ins a day. But if you stretch those numbers out over a week, you get “only” 600,000 check-ins. That means that in under a month, Foursquare’s check-in rate has almost doubled. Actually, it has doubled. 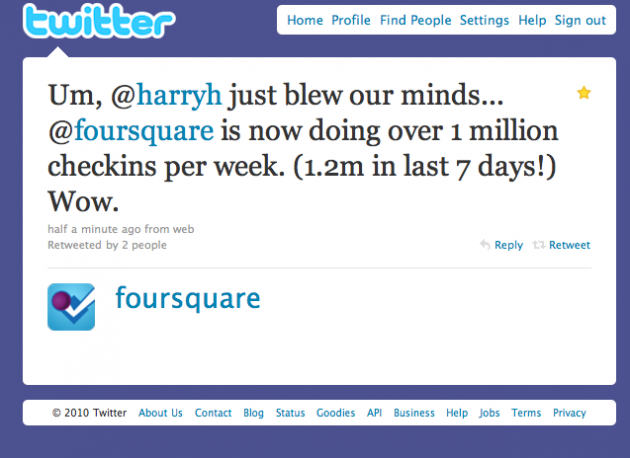 As Foursquare also notes in the tweet, the last seven days have seen 1.2 million check-ins. While traffic may be up threefold over the past two months, the check-in rate is growing even faster.